The Philadelphia Eagles have been active this offseason. The newcomers include Asante Samuel, Chris Clemons, Trevor Laws, Quintin Demps, Kris Wilson, Lorenzo Booker, and DeSean Jackson. Asante may have grabbed all of the headlines, but unfortunately, Asante doesn’t play wide receiver (and to date, only Lito has been rumored to be moving to the other side of the ball). Despite attempts to upgrade the receiver position, the Eagles return the same receiving corps. The one difference is Jackson. Jackson can be the playmaker that the team needs, and teammates crave, at the WR position. Jackson brings a new dynamic element to the receiving corps. The team is still waiting for Reggie Brown to assume the role as a No. 1 receiver. Brown’s inconsistency will make this a wish that continues to go unfulfilled. Kevin Curtis would be best featured in a Wes Welker-type role and not the focus of the passing attack. Like Brown, Curtis was also inconsistent from week to week, with the majority of his productivity achieved over a few games last year (221 yards against the Lions). Hank Baskett and Jason Avant are nothing more than possession receivers. Avant has good hands and is a solid route runner, but lacks big-play potential. Baskett will struggle to even make this year’s roster. Even as a No. 4 or 5 receiver, Greg Lewis disappears too often for large stretches of the season. Jackson also has his shortcomings. Scouts say he is too small (5’10”, 175 pounds) to get off the line and absorb the hits. You can’t ignore the truth of such facts. But receivers of similar stature have thrived in this league (Mark Duper, Steve Smith, and Santana Moss). Jackson brings speed, athleticism, great hands, and big-play potential. Teaming Jackson with the speedy Westbrook and Booker, gives the Eagles' offense a new dimension. Mismatches will be created, and Brown and Curtis will begin to flourish in their true roles as secondary receivers. 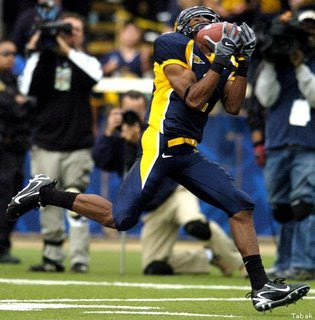 At the University of California, Jackson had 28 touchdowns in 36 career games. Jackson also recorded 52 plays of 20 or more yards. Jackson gives the Eagles a deep threat to utilize McNabb’s deep-throwing ability. Short passes also become opportunities to break the big play. If the past holds true, Jackson, being a rookie wide receiver, may struggle to even get on the field. The Eagles west-coast system is a difficult system for rookies to learn and feel comfortable executing on the field. The reviews to date from mini-camps are that Jackson is ahead of the learning curve. Even prior to the Eagles' drafting Jackson, Jackson was working out with the greatest west-coast receiver off all time, Jerry Rice. Rice also had nothing but rave reviews for Jackson. I understand that all of this may be wishful thinking, and that Jackson could just be another Eagles receiver that becomes average and nothing more. In an offseason where the Eagles failed to land Chad Johnson, Larry Fitzgerald, or Mike Williams, a fan needs a reason to hope. This hopes falls on Jackson. Jackson brings excitement to the receiving corps. If all else fails, Jackson breaking a kickoff or punt return for a touchdown will keep the other receivers off of the field!